And the attached proposal. The attachment was just an indication of what they would do when they submitted the proposal but now they are getting into the planning stage and have asked me and another member of the cycle forum for opinion/ideas for the redesign. I thought I ought to take advantage of the CEoGB's great wealth of knowledge and experience before submitting my ideas. 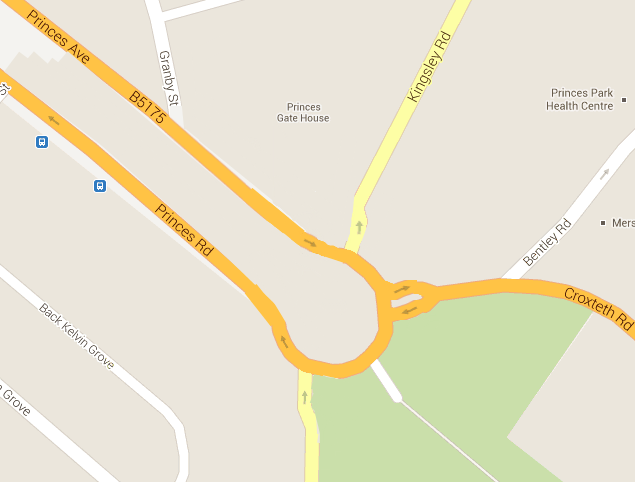 Princes Avenue - currently three lane entry to the roundabout with a but stop bay out of the traffic lane. I propose reducing to two lanes, and put the bus stop in lane 1, this should allow enough room for a floating bus stop and protected lane for cyclists entering the roundabout. Kingsley Road - currently has a wide exit, narrow this significantly. Princes Gate East - reduce to one lane each way, create much larger build outs. Possibly add a zebra crossing. Park entrance - increase size of build outs. Princes Gate West - reduce width of lanes and increase size of pedestrian island. Princes Road - possibly reduce to one lane with some sort of cycle lane. All ideas / help with visualisation welcome! But I need to submit them by next Wednesday. This is being paid for by Sustrans yet the proposal as shown in your attachment doesn't include any facilities for cycling at all ? Amazing. Where do we start ? Your idea of reducing the inbound roads to single lanes is certainly a good one. However, a roundabout of this size and with the level of traffic that it apparently takes should never have cyclists and motor vehicles sharing lanes. I really think you need to try for the same thing in Liverpool - especially for a project which is being paid for by Sustrans. This is an occasion when the oft-claimed "there's not enough space" is definitely not true. The existing roundabout in Liverpool is huge. Yes, I've seen your photos before. With the situation in Liverpool we are faced with a few problems. Firstly, TRL haven't finished their investigations in to Dutch style roundabouts, secondly, design ideas have to be submitted next week to go to design team and the whole thing has to be built by December. So no time to wait for the report. Looking at your photos, most of them appear to be away from urban centres and don't also have to provide for pedestrians. The last one which is in an (sub)urban area has no through routes, which is somethng that isn't going to happen in Liverpool. So we need a way to provide for bikes, cars, peds and buses within this space under current road design guidelines. Sorry to sound so negative! That's just the reality we have to deal with at this moment in time. We are pushing for improvement and frankly the fact they are even considering reducing the numbers of lanes and providing a floating bus stop is a big step forward! It's all further complicated by the fact that it is not a typical roundabout, the exit up Kingsley road requiring the use of the give way lines on the roundabout itself. If that exit could be closed it would make a massive difference but I doubt that would be possible, it is surprisingly heavily used. However I will suggest it. While nothing like as good as a separate track, pointing them towards the tighter geometry would mean there's loads of space to put a track in later, once the TfL research is done. Actually, that's all untrue. You obviously didn't look very closely at the examples because in ten of the twenty examples, those where there are expected to be large numbers of pedestrians, separate paths are provided for pedestrians separate from the cycle-path. What's more, apart from one example which is just a few metres North of the city boundary all the other 19 examples are most definitely urban. The examples also all accommodate buses (or can - I'm not absolutely certain that there is a bus route across every last one of them). I simply do not buy into the exceptionalism with which people suggest that any example in the UK (USA, Australia, wherever) must be different to every single example from the Netherlands. There is nothing special about your drivers, your cyclists or your pedestrians. They all want the same as their Dutch counterparts - i.e. to reach their destinations safely and conveniently. Ask yourself why it "has to be built by December". This is surely nonsense. Any number of projects are delayed for one reason or another, and I'd have thought that waiting to be able to accommodate the TRL research results can be seen to be a good reason for a delay in this case. It won't be funded by Sustrans, they will just be managing funds that have come from elsewhere, usually government spending (ie taxpayers' money) or sometimes lottery funding. The non-standard arrangement at the end of Prince's Avenue looks at least confusing, and possibly non-standard or illegal - can the ranty highwayman or some other professional comment on the short zig-zags after the crossing and the give way markings within the roundabout ? It's hard to know what the 'before' state was - are the dark grey areas new build-outs? It looks like Prince's Gate East was one lane and it's being increased to two - not sure how this is going to encourage non-motorised (ie Sustrans supported) modes of transport. Just compared with http://goo.gl/maps/EERgt and I can't see any difference at all, certainly not 300k's worth! FWIW I agree with a lot of bornagainst's comments, 300k won't do much here. I'd like to be more positive but all I can think of is to suggest that the pedestrian crossings are raised (all of them; signalled, zebra and marked), creating speed bumps that might slow some drivers down. ps. Has anyone else noticed that this drawing was printed 7.5 months ago ? Makes me wonder if they're only asking you so they can say they have consulted cyclists! Jonathan, the arrangement at the end of Princes Ave/Kingsley Road is the current arrangement and presumably not illegal, although it would be nice if it could be proved to be so. The dark grey areas are the new proposed build outs, and this was the proposal put to Sustrans several months ago. However the proposal was just a general idea of what might be possible as created by the cycling officer, not a final design. I am assured that nothing is fixed as a formal design conforming to all the legal requirements has not been created, hence this consultation with members of the cycle forum who are being asked for input before it goes to the design team. With that wierd give way in the middle of it. Is there any scope at all for closing some of the routes to through traffic and getting rid of what looks like quite a complicated junction? It's hard, not knowing the area at all, but I take it Princes Road / Princes Ave are both one ways, so effectively that's a big dual carriageway which is going to dominate the traffic and (I imagine) isn't very cycleable. Of course what I'd be itching to do would be to make Princes Ave a two-way through route and close off Princes road to through traffic and turn it into a bicycle road, but without knowing the area at all I've no idea of that would be feasible. I don't envy you in trying to make this a better roundabout for cyclists. Without demolishing the whole thing and starting from scratch, I think you've got a very difficult task. I used to ride Princes Avenue outward regularly, entering the roundabout and taking either the 2nd exit to Princes Gate East, or the 3rd exit into the park. You need to be a very assertive, alert, quick and perhaps even foolhardy cyclist to do it, especially if you're heading for the park entrance. The 'Give way' stop in the middle is terrible for cyclists come down Princes Avenue, as cars will leave it til the last second / smallest of gaps before pulling out. In the end I've bottled out of using this roundabout and just go an entirely different route.. I've looked at the plan you've done and with the best will in the world, this rebuild will still need cyclists to be very assertive (indicating, changing lane, turning and looking back at the same time level of ability), alert, and quick.. and I just don't know how many extra riders will suddenly decide to take this route? I really can't see an easy improvement.. Make the whole of the neighborhood 'shared use' pavement would probably see more normal people cycling around the area. Or turn it into a 20mph zone. OR close off the whole of the 'give way' section of the roundabout, and join the roundabout up to the central boulevard. I know it's unlikely, but closing Kingley Rd completely wouldn't be unprecedented.. Just up Princes Avenue, Beaconsfield / Cairns / Jermyn st have been closed off? It's £300k, but I honestly don't think it will see any real rise in usage figures outside of any rise or fall in the whole of Liverpool.... and once the money is spent, it becomes "well we spent the money and the bloody cyclists don't even use it...."
Sorry to sound so negative. It's a donkey of a junction, it really is. Thanks for all your further comments. This is what I propose to submit unless we have any more good ideas in the next 24 hours. In my opinion it would be advisable to delay the design and build of the roundabout until after the TRL has released their report into Dutch roundabout design being used on British roads. If design and build were to go ahead in Q3/4 2013 it would almost immediately be superceded by improvements in best practice that come from the TRL report. Due to the Princes Park roundabout being such a difficult and key junction for cyclists it is crucial that only the best facilities possible are considered otherwise cyclists will have to suffer with poor quality infrastructure for many years while competing cities such as Manchester move ahead with more modern designs. That being said if there is no alternative but to design and build before the release of the TRL report there are still several significant improvements that can be made. The available space on the roundabout should be reduced as much as possible and all radii tightened as much as possible to physically reduce speeds. The junction with Kingsley Road should be closed, this is the most difficult and design-limiting aspect of the junction, closing it would open up more possibilities. The entire roundabout reduced to a 20mph limit. Any pedestrian crossings across the arms should be situated on raised tables. The bus stop on Princes Avenue made into a floating bus stop with a cycle lane behind it that continues across the junction of Kingsley Road (should it remain) with priority for the cycle lane. The only think I would add would be investigating whether it needs to be a roundabout at all. I have added attachment to the first post of the thread showing two possible ways of removing the roundabout and converting it back to a junction. It maintains reasonable traffic flow and has segregated cycle paths between all arms of the junction. It will probably require a No Right Turn out of Princes Gate West and possibly a No Right Turn into Princes Gate West, also anyone coming from PGE or PGW wanting to go to Kingsley Road would have to head off down Princes Road and back up Princes Avenue via one of the cut throughs in the central reservation. But it would be a significant improvement for traffic exiting PGW as they no longer have to give way to traffic coming from Princes Ave. Either plan gives good visibility for people using the crossings, massively reduces potential traffic speed and separates cyclsits from traffic at the most dangerous points, whilst also giving cyclists by-passes. It avoids installing a lot of expensive signalling, most of the work is done by reallocating space which is just a more elaborate version of what has been planned for. If anyone fancies doing a better visualisation, feel free! It's good to see all kids of options being discussed. Without adding the unenviable task, I notice Liverpool is due to start a 'boris bikes' style scheme, and so whilst the lycra brigade (Me-ish) might be able to (unwillingly) handle any redesign that keeps it as a roundabout, I can't see how a tourist / inexperienced rider pootling along at <12mph could possibly safely navigate any redesign that keeps it as a 'UK style' roundabout. Nothing too drastic - trying to be reaslistic about what would ever get passed - I'm no expert!.. Just close off the crazy 'give way' bit.. send traffic one way down a couple of roads.. Croxteth Rd is still an issue.. But it gives cyclists a chance to enter and exit the park without needing to look 3 ways at once.. This is what I submitted in the end…. Having read the original proposals and visited the site I was very encouraged that this junction has been chosen for a significant upgrade, it is clearly a junction well used by many cyclists, perhaps more than anywhere else in the city, but their needs are not catered for at all, primarily because there is no safe access to and from the park gates from Princes Ave/Road. Creating a safe and convenient link between these two points is of great importance. However any improvements should not be made with only people who currently cycle in mind, these are people who cycle despite there being poor facilities, if we want to increase cycling we must consider what facilities are required to encourage people who don't already cycle. However this should not lead to a two-tier system where we expect novices to share safe, inconvenient facilities with pedestrians and the experienced to share dangerous, convenient facilities with HGVs, there should be one system, safe enough to get novices on their bikes and convenient enough that the experienced will prefer it to cycling amongst the traffic and without creating conflict with pedestrians. Firstly I asked for advice from members of The Cycling Embassy of GB, a group who campaign for better infrastructure for cyclists and also Mark Strong of Transport Initiatives a former resident of this city and now transport consultant. Both of these suggested that fundamentally the junction should not be a roundabout but ought to be a different type of junction altogether, the attached Princes Park Gate.pdf document shows several possible ways to do so. The first two scenarios are based on joining the roundabout to the pavement on one side or another. Obviously just rough sketches to show the sort of thing that can be done. They almost entirely remove cyclists from points of conflict with motor traffic, provide better crossing points for pedestrians and improves the major traffic flow between Princes Gate East and Princes Road as they no longer have to give way to traffic coming from Princes Avenue. Visibility is increased and points of conflict are reduced all round which will mean fewer accidents. Radii are all tighter and lane widths narrowed which will lower speeds and minimise injuries when accidents do occur. Another option for removing the roundabout is to create a four armed signalled crossroads, in which Princes Avenue is closed to through traffic and Princes Road becomes two way. Access to the roads off Princes Avenue would then be made via the signalled junction at Upper Warwick Street. The crossroads would have a cycle specific phase to allow for the high flow of cycle traffic to cross directly over the junction between the park gates and Princes Avenue. If it must remain a roundabout it would be advisable to delay the design and build of the roundabout until after the TRL has released their report into Dutch roundabout design being used on British roads. If design and build were to go ahead in Q3/4 2013 it would almost immediately be superceded by improvements in best practice that come from the TRL report. Due to the Princes Park roundabout being such a difficult and key junction for cyclists it is crucial that only the best facilities possible are considered otherwise cyclists will have to suffer with poor quality infrastructure for many years while competing cities such as Manchester move ahead with more modern designs. Besides these major redesigns there are other design principles that should be considered in any design. Thanks for the comments. I have had a look at the sketch plans and also discussed them with a colleague in Traffic Management. · To prevent rat running due to the closure of Kingsley Road , Bentley Road should have filtered permeability . Stopping up Bentley Road but still allowing cyclists through would not be possible as a turning circle would be required for vehicles to enter and exit both from Princes Gate East and Lodge Lane (eg resident access and refuse collection vehicles). Just had a quick look through, but it honestly appears that any suggestion which could significantly improve this junction for cyclists (and future new cyclists) has been immediately thrown out. Stop me if I'm wrong, but ANY suggestion which prioritises Cyclists / Pedestrians is going to get thrown out because it will have a negative effect on motorised traffic flow. It's a square peg in a round hole. See how they bloody like it. Stop me if I'm wrong, but wasn't the money originally allocated as part of DfT "CYCLE SAFETY GRANTS"? Which I'm sure were intended to.. well, actually make cycling safer? LCC can't have their cake and eat it surely? If they've taken the money (do LCC match this grant with their own money? so £600k in the end?) then surely the money must be spent on actually making this roundabout safer for cycling? Liverpool City Council’s Cabinet Member for Transport, Councillor Tim Moore, said: “This is great news for cyclists in this city, and yet another success story in our drive to make Liverpool cycle-safe." Even the language above implies LCC are happy to just see how it goes..
"However the proposed physical changes to the junction have the objective of reducing speeds"
There is a hell of a difference between 'objective' and 'result' here.. especially if they don't actually lower the legal limit. So I guess that because the money must be spent asap, it'll end up as "how about some lovely red painted tarmac and a zebra crossing?" Can't really make sens e of the PDFs. It is very difficult to improve safety for cyclists without impairing traffic flow. None of the suggestions appear to be a significant improvement. If the traffic flow is disrupted drivers will be more irate and more aggressive toward cyclists. the only way to guarantee safe use is install traffic lights with a light for bikes exiting the park and heading onto the avenue or Kingsley Road. Otherwise a red cycle lane might raise drivers' awareness of cyclists but in my experience people are fairly tolerant of cyclists taking up their space ie a whole lane on this roundabout (which is what I do). The Kingsley road cycle lights by the Women's slow me down and hence I tend to stay in the main traffic lane. A proposed change needs to bring improvement. If the bus stop is pushed out a lane (as has occurred on Aigburth Rd) this, in my experience, makes for more hazardous cycling as cars try to pull into the second lane. Are there any stats in the public arena about bicycles involved in accidents at this site? I've been researching this roundabout because it is so dangerous (if anything it's worse since the changes made a couple of years ago) and was very surprised to find out that it was paid for out of a cycling safety fund! Virtually all of the suggestions made on this thread were completely ignored. The priorities were changed so that it is more of a normal roundabout and a zebra crossing was added on one of the exits - you have to cross four lanes of traffic at once with no visibility from traffic approaching round the bend. I've seen several near misses because traffic is failing to stop when people are already crossing - drivers just sound the horn and swerve around them - and there is a lot of verbal abuse of pedestrians trying to use this crossing. There is absolutely no provision for cyclists not even any paint. It's two lanes into the roundabout, and cars often go in the outside lane to get around a cyclist and then turn left across you. The traffic approaches very fast and often fails to stop when a cyclist is already on the roundabout meaning you have to brake /swerve. I'm an experienced cyclist and used to traffic, but it's so bad that I've actually started coming back from work at a different time of day to avoid it during the rush hour (alternative routes are not always safe due to antisocial behaviour on the quieter streets during the afternoon/evening). A member of my cycling club suffered a head injury after a hit and run on this roundabout last week. Is there an evaluation of the effects of these so called cycle safety measures? Or is it a case of ask for advice, ignore it, make the situation worse, and then go on about all the money that's been spent of improving cycle safety? I've been in touch with my local councillor but just get the usual response that there's nothing they can do. The whole thing was an absolute con-job. Good money spent on 'cycling improvements' that failed to deliver any improvements whatsoever. Sustrans need a massive kick up the backside for putting money into this. The advice to any cyclist thinking of using this roundabout? Avoid at all costs. Do you have a date when this work was completed, the response from the local authority suggested December 2013 as a cut-off? Looking at Crashmap, from 1st January 2014 to 31st December 2016 it looks like there have been 8 slight and one serious cyclist casualties. I'd hope they have systems in place (i.e. their road safety team) that would have identified that sort of number of collisions affecting one specific user group in just the past three years. I can't remember exactly when it was finished but Dec 2013 sounds about right. Comparing before and after on Crashmap, it definitely seems worse after (assuming same numbers of cyclists, cars and reporting rate, which have probably all changed!). The person I know of didn't report his accident so that's at least one more serious one.